Richard Davis is the Professor of Bass (European Classical and Jazz), Jazz History, and Combo Improvisation at the University of Wisconsin-Madison. 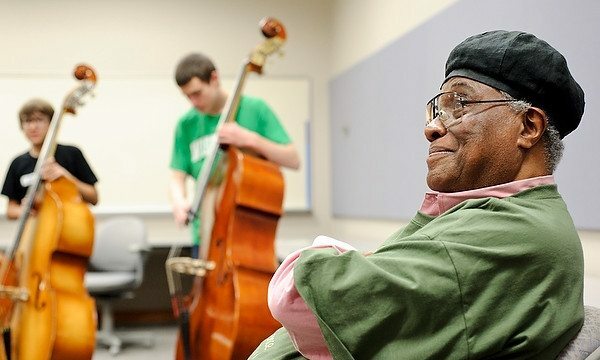 Chicago born, Richard Davis came to the UW-Madison in 1977 after spending 23 years in New York City establishing himself as one of the world’s premier bass players. Down Beat International Critics Poll named him Best Bassist from 1967-74. He took the same honors from that publication’s Readers Poll for seven consecutive years. A virtuoso, highly respected in any jazz style, he has worked with a long list of stellar artists. He has made over a dozen albums as a leader and featured artist for various labels, including the much praised Epistrophy and Now’s the Time (MUSE). Some of his performance/recording credits include Ben Webster, Sarah Vaughan, Eric Dolphy, Dexter Gordon, Frank Sinatra, Barbara Streisand, John Lennon, Miles Davis, Thad Jones/Mel Lewis Band, Ahmad Jamal and a host of other notables. Mr. Davis is equally at home in the world of classical music, having played under the batons of Leopold Stokowski, Igor Stravinsky, Pierre Boulez, Gunther Schuller, and Leonard Bernstein. His great versatility as a bassist keeps him in constant demand for worldwide concert appearances. For over 40 years he has drawn enthusiastic audiences in Europe, Russia, Brazil, Puerto Rico, Cuba, the West Indies, Hong Kong and Israel. The promotion of Richard’s 1987 album and compact disc Persia My Dear (DISC UNION), with Sir Roland Hanna & Frederick Waits, takes the ensemble frequently to Japan, where in the past decade, his popular following has elevated him to superstardom. He also holds two honorary doctorate degrees.